If you’ve already read the “About Me” section, you know by now that Tripper has firmly set its ground as a sustainable cultural tourism blog and as a go-to source about sustainable tourism in Lisbon. 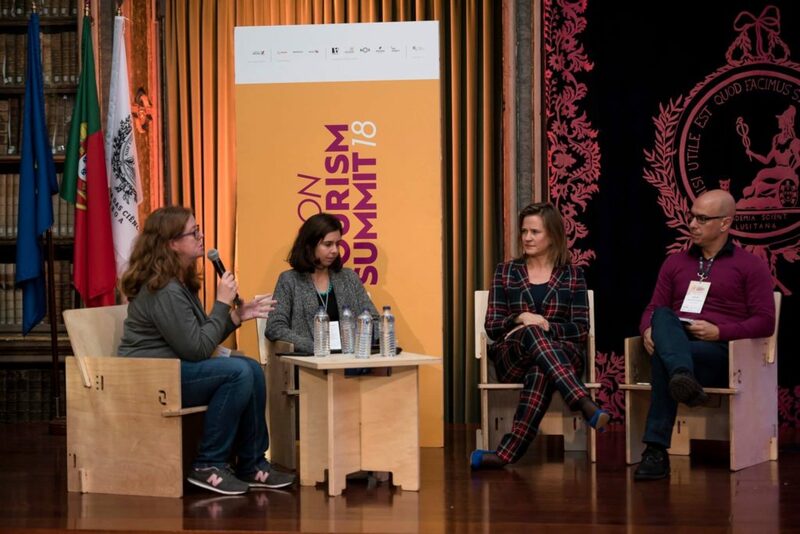 Because of the blog, in 2018 I was quoted by Skift on a piece about overtourism in Lisbon, and I was invited by Beta-i to moderate a panel discussion on Conscious Travel during the 2018 Lisbon Tourism Summit. In January 2018, I’ve also stepped forward to volunteer as a Travel Massive Chapter Leader in Lisbon. I put my beliefs and my passion for sustainable cultural tourism ahead of everything else when working with a brand for Tripper. That being said, I don’t work for exposure nor for free. I believe in long-term partnerships, and if you recognize the benefit in working with Tripper, I’m open to reach an agreement on how both of us can profit from that relationship. Ever since I’ve ventured into my freelance writing career in 2014, I’ve been continuously developing the two skills that have been the cornerstone of all my work: storytelling and SEO. And, yes, it is possible to write both for human readers and search engines, sometimes in the same blog post. My first experience with Lisbon Cooking Academy is an excellent example of this — their SEO consultant had a keyword they wanted to rank for, and I had an angle for the story; both blended exceptionally well together. Since its inception in June 2014, the blog has matured, and I now prefer to dedicate content to a destination instead of just a specific business, service, or brand although I have done so in the past with Devour Madrid Food Tours, Lazy Flavors, and room007 Select Sol Madrid. Using a regular event as an excuse to travel to a specific destination (like I’ve done with Fantasporto or the Azores Fringe Festival). Most cultural tourists visit for the event first and the destination last. Using a specific tour or service as an allure to the destination around it (like I’ve done with Rota das Vinhas do Pó). Writing solely about the destination, mixing itinerary-like information and storytelling, where the mention to brands and services is secondary (like I’ve done with One Weekend in Maia). All partnerships and content must fit the values and mission of the sustainable cultural tourism blog that is Tripper, and there are no exceptions to this. There are dozens of emails that go unanswered weekly specifically because the proposals for partnerships don’t fit the blog nor the audience. For an overview of what kind of services I offer and prices, you can see my updated Media Kit (by clicking this link you will open a Dropbox folder in a new tab with downloadable .pdf files). But don’t take this as a closed road. We can always find a creative way to meet our goals, and there’s always room for discussion. Tripper’s readers are independent travelers, mostly women with ages between 25-44, looking for unique experiences with a high positive impact on the local communities and the local economy. They have higher education, and they understand traveling is a privilege or a reward rather than a right. They buy experiences, so for them, it’s important to connect to a destination at a much deeper level than just sightseeing. They prefer to explore lesser-known destinations but don’t dismiss a visit to a famous tourist destination as long as it’s presented to them from a unique and sustainable angle. The quality of the experience is more important than the price tag. However, they do research a lot and compare prices before settling for a service. They value the honest reviews or endorsements of a blogger who’s an authority on the niche over the ones you’d typically find in crowd-sourced platforms. Aware of “greenwashing” strategies by some companies, they’ll most likely use trusted information from different sources to build their own DIY itinerary. Therefore, promoting organized tour packs or one-size-fits-all type of travel experiences will not resonate with Tripper’s target audience. Tripper is written in English, not as a way to narrow its reach to a specific location, but to be as universal as possible. To prove that point, the top ten countries that read Tripper’s blog posts are the United States, Portugal, Canada, United Kingdom, Germany, India, Netherlands, Spain, France, and Belgium. As a freelance web content writer and travel blogger, I’m responsible for every piece of content I write and publish on my blog. I believe there is a difference between tourists with an online platform who like to call themselves “travel influencers” (which may or may not include a blog) and professional travel bloggers. That means that I hold full editorial control over what’s published on the blog, without exception. Tripper doesn’t accept guest posts from fellow travel bloggers (or SEO representatives disguised as such), although it has in the past. Any emails with such requests will be marked as spam and go unanswered. Masterclass About Fish @peixariacentenaria . Our Lazy Flavors' students of the day are eager to get their hands on the fish and get it ready for lunch!